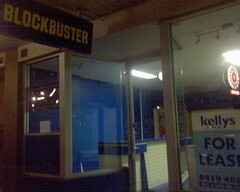 Walking down Enmore road to trivia at the Duke I noticed the sorry state of Blockbuster Newtown. An empty shell of its former self. Closed earlier today, apparently, on 8 September 2009 according to the sign. I remember when it was in a larger premises across the road. But the change in consumer behaviour moved it to a smaller location. And now it has closed altogether. The Buggles sung in 1979 that Video Killed the Radio Star. I suppose the new tune should be Internet killed the Video Star. 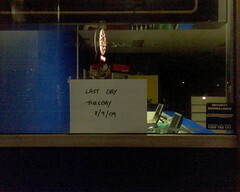 This entry was posted in Photos, Shopping and tagged Blockbuster, Newtown, shop, video. Bookmark the permalink. Were you a member? I have received 2 letters from some mob in melbourne requesting $15 debt (2 days overtue video a few days before it stopped trading) plus $9.50 fee to collect debt plus another $22.50 fee becasue I haven’t paid the first fee within 18 days! Now this mob reckons I owe them $52 because Blockbuster stopped trading – how does that work?